It was as if he’d fallen off the back of a powerboat running at three-quarters throttle, with one big difference. Meridian X was flying a massive spinnaker sail in a violent squall, and it was all helmsman Dave Flynn could do to keep the boat under control. Before the eight crewmen remaining on Meridian X could come back for Wheeler, they had to get that sail down. The night was like pitch, and the coordinates didn’t indicate Wheeler’s exact position. They were simply a place to start looking. 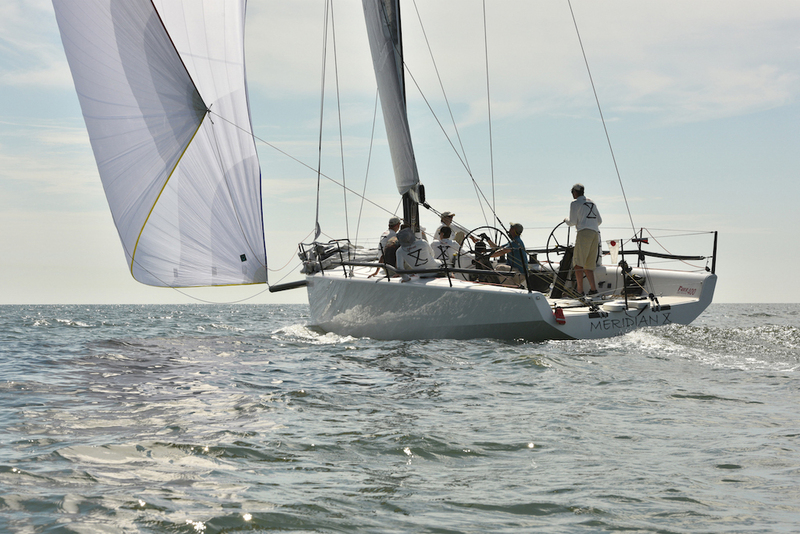 Meridian X (left) flying her A2 spinnaker in a moderate breeze. Courtesy photo. 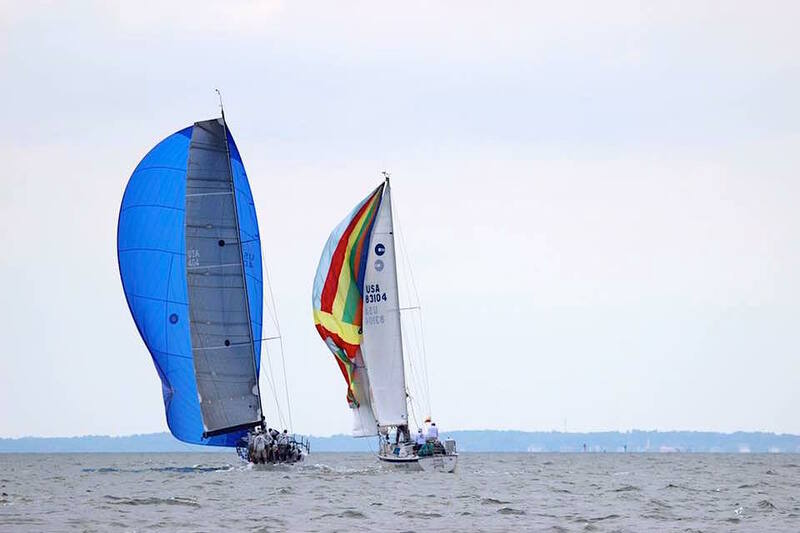 Meridian X stretches her legs on home waters during the 2018 Southern Bay Race Week in Hampton, Va. Courtesy photo. Flynn was incredulous. “I said, you can’t hear a whistle out here. It’s loud, it’s windy, stuff’s flapping and crashing and banging around.” But then another crewmember heard it. They knocked the motor back to idle. Now there was no mistake. Flynn steered toward the sound. “Once I was able to get my hands on Mark physically it was an overwhelming relief. It was like a flood that just washed over the boat.” —Meridian X bowman Graham Garrenton. As Meridian X approached from the north, another racing boat was coming from the south. The crew aboard the Farr 395 Aftershock had stopped racing to join the search. They too heard the whistle, and put a spotlight on Wheeler. The men on Meridian Xmaneuvered to recover their friend. 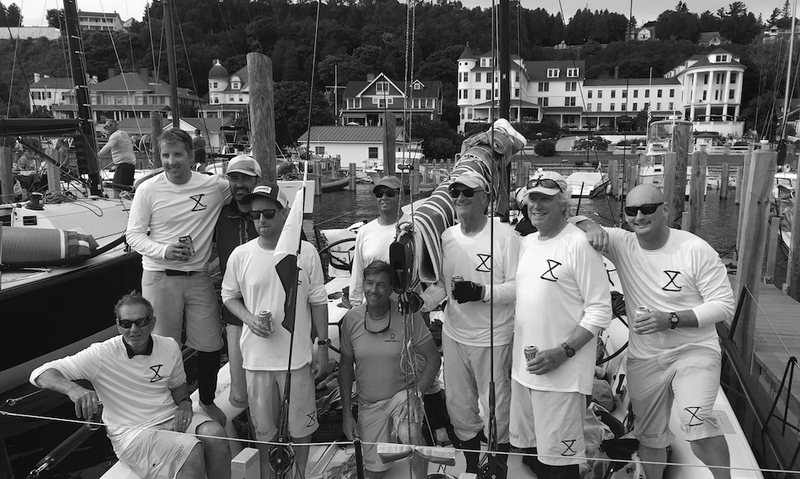 The Boys in the Boat: The Meridian X crew after the CYC Race to Mackinac in 2018, the year after Wheeler’s man-overboard incident. L-R: Sledd Shelhorse (owner), Max Plarr, Patrick Everhart, Graham Garrenton, David Flynn, Harold “Beau” Warren, Ron McLean, Mark Wheeler, Jeremiah Dull. Courtesy photo.